Mindful Eating – Nutritious Fruit & Veg? This summer salad is bursting with flavour and colour. With no dressing this salad remains equally tasty day two but to obtain the optimum nutrients, it is best eaten straight away. You can also add white cabbage for a raw coleslaw version. Roughly dice apple and onion. 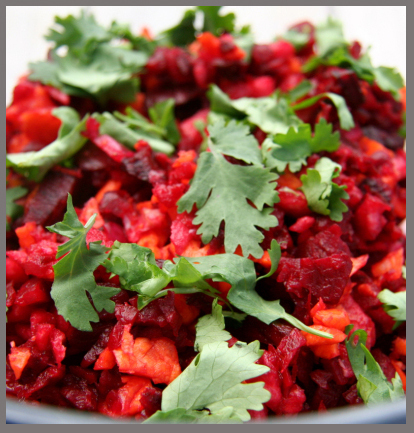 Grate or slice the beetroot and carrot or you can use a blender but will have to blend the ingredients separately. Or if you have a Thermomix then place all ingredients, quartered, into the TM bowl of your Thermomix. Chop on speed 4 for 7 seconds. Transfer the salad into a serving bowl and garnish with roasted walnuts (optional) and fresh coriander. Enjoy your Mindful Monday meal! Fruits and vegetables available to most people today don’t contain the nutritional value they had about 40 or 50 years ago. Vegetables have a set amount of nutrients when harvested and begin to lose them the minute they are cut off from their food source. This decline is hastened by the things we do to them such as cutting. So, instead of purchasing ready-to-eat “convenience” cut vegetables which have already lost much of their nutrients, buy the most recently harvested, whole vegetables you can. Only cut them when you intend to use them. Some food is most nutritious uncooked, while other kinds need heat to bring out the best in them. Beets lose more than 25 percent of their folate when cooked. Eating them raw will preserve this brain compound. Beets have also shown to help prevent dementia, according to Wake Forest University researchers. Onions are best eaten raw to get the most out of the hunger-busting phytonutrient allicin. Carrots eaten raw are an excellent food, but there is some research showing that cooking them may actually help to boost their nutritional content. One study found that cooked carrots had higher levels of beta-carotene and phenolic acids than raw carrots, and the antioxidant activity continued to increase over a period of four weeks. Adding carrot peels to a carrot puree also boosted antioxidant levels. Important Request: If you know of any farmers that are producing GM free maize or soya for feed, please let us know. Or if you know of any farmers that are using alternative feeds (such as sorghum) successfully then please let us know too.